This is the year of owning it all in the tech industry. After years of speculation, major tech companies including Apple, Google, and Microsoft are finishing up their ecosystems that tie your music, photos, videos and documents to digital devices deeply integrated with online storage and sync. Not wanting to be left out of the party, Facebook may soon be vying for a piece of that end-to-end dream with a Facebook-branded smartphone. Mobile computing is becoming increasingly important as users turn toward tablets and smartphones for everyday computing. Facebook said that as of late April an average of 500 million people access the social network through mobile devices every month. With so many mobile users, Facebook needs a strong mobile presence. Facebook is worried that if it doesn’t make its own smartphone the social network will be just another app forced to exist on third-party mobile platforms, according to The New York Times. The problem with depending on third-party mobile platforms such as Android, iOS, or Windows Phone is you have to play by the rules set out by Google, Apple, and Microsoft. Facebook can’t, for example, offer purchases using Facebook credits on its iOS apps. To get around this issue Facebook was rumored to be working on an HTML 5-based application platform for mobile devices codenamed Project Spartan, and the social network’s newly announced App Center may be the beginning of that plan. But owning your own smartphone solution, if you can convince people to buy into it, is even better than relying on the Web. If you own the hardware, you can shape the consumer experience the way you want it to be -- and shut the other guys out. So Facebook may be getting down to work on a potential smartphone. We’ve already seen some signs of this such as Facebook breaking down its mobile presence into three apps: core social networking with Facebook, photo sharing with Facebook Camera, and messaging with Facebook Messenger. And who knows? Perhaps the future will also see more apps such as Facebook Contacts, Facebook Events, or Facebook Video. The company is also busy hiring people with experience building smartphone hardware, according to the Times. 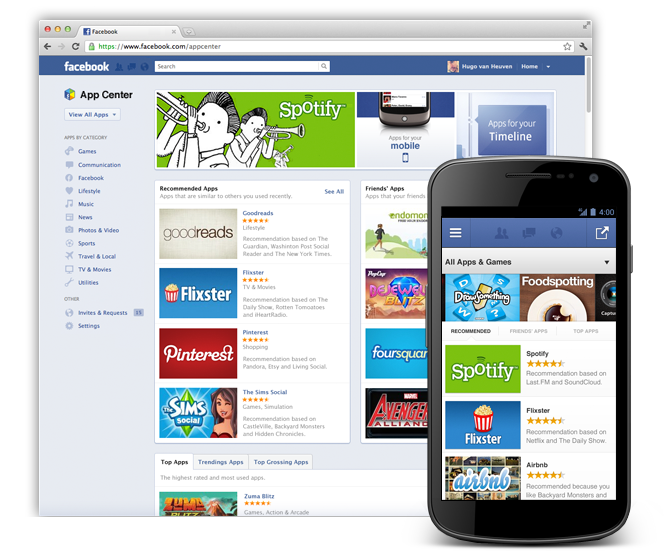 There are also rumors that Facebook is looking to purchase the Opera Web browser, giving the company another important piece for a future smartphone. While Facebook purportedly scrambles to make a device, other companies are almost finished rolling out their solutions. Google embeds its numerous online services into the Android mobile OS, and is making a play for PCs with Chrome OS. Apple is using its new online sync and storage solution, iCloud, to complete its end-to-end offering that includes mega popular mobile devices including the iPad, iPhone, and iPod Touch. Microsoft’s Windows 8 for PCs and tablets, expected later in 2012, will include the Metro-style, touch-friendly interface and feature Hotmail, SkyDrive and Bing baked right in. The rumored Windows Phone 8, codenamed Apollo, is also expected to feature deep integration with Windows 8. Then, there are the dark horse candidates also hoping to convert users to their ecosystems such as Lenovo and Acer. Lenovo wants to provide personal cloud storage and sync tied into smartphones, tablets, PCs and televisions. Acer launched AcerCloud, an iCloud-style sync service that shares music, photos, videos and documents between devices. Both companies announced their plans during the Consumer Electronics Show in January, but have yet to prove they are viable candidates. With so many end-to-end platforms out there already is there even room for a Facebook phone?